After collapsing Stormont and refusing to take their seats in Westminster, Sinn Fein have left their supporters voiceless during the Brexit negotiations. Instead they have had to resort to white line protests and sending a letter to the Irish Prime Minister. We have often heard SF and nationalism make the argument that Brexit affects us all. Of course if that were the case then why send a letter to the Irish PM based on a sectarian division? The authors of the letter have excluded any unionists and instead claimed a whole section of civic society as ‘nationalist’. How this professionally compromises some of those who have sacrificed their professional neutrality in order to identify themselves as ‘nationalists’, by signing a public political letter, is another matter. Unionist Voice has taken a sample of the signatories and highlighted their backgrounds in order that this partisan and sectarian political letter can be exposed for what it is. A publicity stunt orchestrated by Sinn Fein. Jim Clinton- Has emphatically denied being an IRA member. 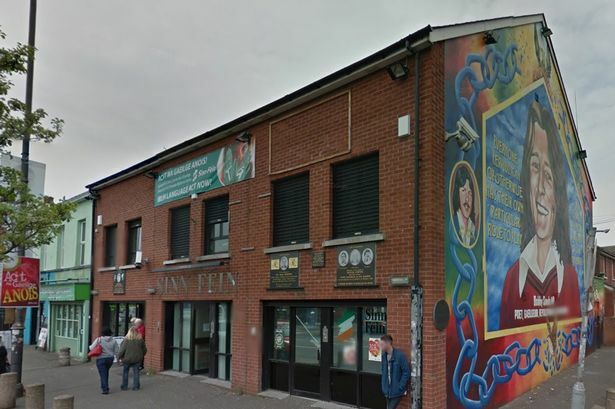 Stood for election for Sinn Fein and was caught in possession of a gun in 1998. Andree Murphy- Relatives for Justice (RFJ) employee. RFJ recently used their twitter page to advertise a glorification of the actions of IRA terrorism. Mark Thompson- – Relatives for Justice (RFJ) employee. RFJ recently used their twitter page to advertise a glorification of the actions of IRA terrorism. Gerard Rice- Sinn Fein front man for anti-parades ‘resident’s group’ in South Belfast. Paul O’Connor- Pat Finucane centre employee and recipient of an OTR letter. Padraig O’ Muirigh- Son of IRA Northern Commander and peace time gunrunner, Sean ‘Spike’ Murray. John Finucane- Sinn Fein Westminster candidate and son of Pat Finucane. Jude Collins- Pro Sinn Fein political commentator. Robin Livingston- Employed by Andersonstown News, owned by Sinn Fein MLA Mairtin O’ Muilleoir. Barry McCafferty- Formerly employed by Andersonstown News, owned by Sinn Fein MLA Mairtin O’ Muilleoir. Liaised closely with Sinn Fein on the promotion of Loughinisland documentary. James McClean- Footballer steeped in controversy due to his pro-republican views and refusal to wear the Poppy to remember all those that gave their lives in defence of freedom. Colm Dore- Sinn Fein supporter regularly seen at party events. Patricia Mac Bride- Former Victims Commissioner embroiled in controversy when a public profile of her referred to her brother as an ‘IRA volunteer’ killed on ‘active service’. Clara Reilly- A prominent activist in the ‘End Plastic Bullets’ campaign, a Sinn Fein front group. Kevin Gamble- Head of Republican Feile. Bill Rolston- Member of Republican Feile Committee. Terry George- The brother of Sinn Fein representative, Michael George. Feargal Mac Ionnrachtaigh- Also known as Fergal Enright, son of deceased Terry Enright and an active member of Sinn Fein culture department. Brian McGirr- The brother of IRA terrorist Colm McGirr, shot by the SAS. The above list is just a snapshot of the 200 strong list of signatories. Many have overt links to Sinn Fein whilst others are arms-length activists. Sinn Fein have consistently strategically filtered supporters into civic society and public posts, alongside using their arms length activists to infiltrate and set up victims and ‘residents’ groups. The above list of signatories is, for the most part, a who is who of arms length Sinn Fein activists. There are serious questions around how some professionals have compromised their apparent neutrality by signing a ‘nationalist’ political letter in such a public manner. 272 Responses to "UPDATED: List of those who have designated themselves as ‘Nationalist’ within their profession "
I want to show my affection for your kindness in support of folks who must have help on your study. Your very own commitment to getting the message all-around turned out to be surprisingly good and has consistently encouraged others just like me to get to their objectives. Your personal warm and friendly guide means much to me and substantially more to my colleagues. Thanks a ton; from everyone of us. it’s new to me. Nonetheless, I’m definitely happy I came across it and I’ll be book-marking it and checking back regularly! Just wish to say your article is as amazing. The clearness for your post is just great and i can assume you’re a professional in this subject. Well along with your permission allow me to grasp your RSS feed to stay up to date with forthcoming post. Thanks 1,000,000 and please continue the enjoyable work. whoah this blog is great i love reading your posts. Keep up the good work! You know, many people are looking around for this information, you can aid them greatly. It’s actually a great and useful piece of information. I’m satisfied that you simply shared this helpful info with us. Please keep us informed like this. Thank you for sharing. Thank you for sharing superb informations. Your website is so cool. I am impressed by the details that you’ve on this site. It reveals how nicely you understand this subject. Bookmarked this website page, will come back for more articles. You, my friend, ROCK! I found simply the info I already searched everywhere and just couldn’t come across. What an ideal site. A person essentially assist to make significantly posts I might state. This is the first time I frequented your website page and so far? I surprised with the research you made to make this particular submit amazing. Excellent activity! I’ve been browsing online more than three hours today, yet I never found any interesting article like yours. It?s pretty worth enough for me. In my opinion, if all website owners and bloggers made good content as you did, the internet will be much more useful than ever before. An impressive share, I simply given this onto a colleague who was doing slightly evaluation on this. And he the truth is purchased me breakfast as a result of I discovered it for him.. smile. So let me reword that: Thnx for the deal with! However yeah Thnkx for spending the time to debate this, I really feel strongly about it and love studying extra on this topic. If doable, as you develop into expertise, would you mind updating your weblog with extra particulars? It’s highly helpful for me. Large thumb up for this weblog put up! or weblog posts on this kind of house . Exploring in Yahoo I eventually stumbled upon this web site. I came upon exactly what I needed. I so much indubitably will make sure to don?t forget this site and give it a glance regularly. web page, it consists of useful Information. web site, I seriously appreciate your technique of blogging. I do enjoy writing but it just seems like the first 10 to 15 minutes are usually lost simply just trying to figure out how to begin. Any ideas or hints? A Clever Way to Find Free of charge Adult Chat Rooms! Chatting over the internet is hugely popular. The problem is there are hardly any free adult forums where we can discuss adult topics. Now, I’m sure you happen to be thinking, “Yes, and these dating sites also impose a fee a regular membership of those free rooms!” This is not always the case. still give you a no cost service for women. simply get given access to a huge adult chatting community which includes hundreds, sometimes lots of people utilizing it at any one time. Better yet, their rooms tend to offer users to be able to hook of their webcams. I love your wp template, exactly where do you download it from? Hiya, I’m really glad I have found this information. Nowadays bloggers publish just about gossips and web and this is actually annoying. A good web site with interesting content, this is what I need. Thanks for keeping this web-site, I’ll be visiting it. Do you do newsletters? Can’t find it. I’m still learning from you, as I’m making my way to the top as well. I certainly enjoy reading everything that is posted on your blog.Keep the information coming. I loved it! What’s Going down i’m new to this, I stumbled upon this I have found It absolutely helpful and it has aided me out loads. I’m hoping to give a contribution & assist different customers like its aided me. Good job. I have been browsing on-line greater than 3 hours thesedays, but I never found any interesting article like yours.It is beautiful price enough for me. In my view, if all web owners and bloggers made good content as you probably did, the web will likely be a lotmore helpful than ever before. I simply couldn’t leave your website before suggesting that I really loved the usual information a person provide on your guests? You need to participate in a contest for among the best blogs on the web. I’ll recommend this web site! This is the fitting weblog for anybody who wants to seek out out about this topic. You understand a lot its virtually exhausting to argue with you (not that I truly would want…HaHa). You undoubtedly put a new spin on a subject thats been written about for years. Great stuff, just nice! Thanks a lot for sharing this with all people you really recognise what you’re talking approximately! Bookmarked. Kindly also visit my web site =). We could have a hyperlink change contract among us! Excellent post. I was checking continuously this blog and I’m impressed! Very helpful information particularly the last part 🙂 I care for such information much. I was looking for this particular information for a long time. Thank you and good luck. Hello, I do believe your website might be having web browser compatibility problems. Whenever I take a look at your blog in Safari, it looks fine but when opening in I.E., it’s got some overlapping issues. I just wanted to provide you with a quick heads up! Apart from that, great site! Hi there would you mind sharing which blog platform you’re working with? I’m looking to start my own blog soon but I’m having a tough time choosing between BlogEngine/Wordpress/B2evolution and Drupal. The reason I ask is because your design and style seems different then most blogs and I’m looking for something unique. P.S Apologies for being off-topic but I had to ask! Great post. I used to be checking constantly this blog and I am impressed! Very useful info specially the remaining phase 🙂 I take care of such information much. I was looking for this certain info for a long time. Thank you and best of luck. I used to be very happy to seek out this web-site.I wanted to thanks on your time for this glorious read!! I positively enjoying every little little bit of it and I have you bookmarked to take a look at new stuff you blog post. This post is genuinely a good one it assists new web visitors, who are wishing for blogging. Thanks for ones marvelous posting! I actually enjoyed reading it, you happen to be a great author.I will be sure to bookmark your blog and definitely will come back later in life. I want to encourage yourself to continue your great writing, have a nice day! The web site style is ideal, the articles is actually excellent : D.
My name is Aly and I would like to know if you would have any interest to have your website here at unionistvoice.com promoted as a resource on our blog alychidesign.com ? I’m really enjoying the theme/design of your website. Do you ever run into any browser compatibility issues? A handful of my blog readers have complained about my website not operating correctly in Explorer but looks great in Firefox. Do you have any ideas to help fix this issue? Wonderful items from you, man. I’ve be aware your stuff prior to and you are just extremely wonderful. like what you are stating and the way in which you assert it.